US District Court Judge James Robart has issued a nationwide, temporary restraining order against enforcing President Donald Trump’s executive order banning nationals from seven majority-Muslim countries from entering the US. The State Department, since being notified by the Justice Department of the ruling from the US District Court for the Western District of Washington, has been in contact with the Homeland Security Department and legal teams to coordinate operations, according to Reuters. Customs and Border Protection officials said they would reinstate visas in compliance with the order. "At the earliest possible time, the Department of Justice intends to file an emergency stay of this order and defend the executive order of the President, which we believe is lawful and appropriate," the White House said in a statement. "The president’s order is intended to protect the homeland and he has the constitutional authority and responsibility to protect the American people." In response, the DOJ will not file an emergency stay request of the order Friday night, a spokesperson said, Reuters reported. Last Friday, Trump issued an executive order that banned citizens from Iran, Iraq, Libya, Somalia, Sudan, Syria and Yemen from entering the US. The rollout of the executive order caused mass confusion, deportations and protests. By Saturday, the lawsuits had begun, with at least 40 active lawsuits in 17 states. At the state level, Virginia, Washington, Minnesota, New York and Massachusetts have filed cases against the federal government. The attorneys general of 16 states and the District of Columbia issued a joint statement earlier this week calling the executive order "unconstitutional, un-American and unlawful." In California, the American Civil Liberties Union (ACLU) filed a lawsuit that seeks class-action status, which New York and Massachusetts have joined. There are individual lawsuits in Georgia, Illinois, Pennsylvania, Texas and elsewhere, NBC News reported. The lawsuits claim violations of the First, Fifth and Fourteenth Amendments, which guarantee religious equality, due process and equal protection under the law, as well as denials of asylum and discriminatory visa processing. “We’re being sued right now in 10 different courts. We’re going to be sued tomorrow in 20 different courts," Erez Reuveni from the Justice Department’s Office of Immigration Litigation told a Virginia judge on Friday. On Friday afternoon, a US District Court judge in Washington state ruled that the combined cases put forward by Washington and Minnesota provided evidence that the executive order has caused immediate harm. Judge James Robart also said that the lawsuit has substantial likelihood of success in challenging the constitutionality of the order, the Seattle Times reported. Robart asks DOJ's Bennett how many arrests of foreign nationals there have been from the 7 countries since 9/11. She says she doesn't know. On Monday, Ferguson became the first state attorney general to file a lawsuit against Trump, the Department of Homeland Security (DHS) and high-ranking Trump administration officials; on Wednesday, Minnesota joined the suit as a plaintiff. 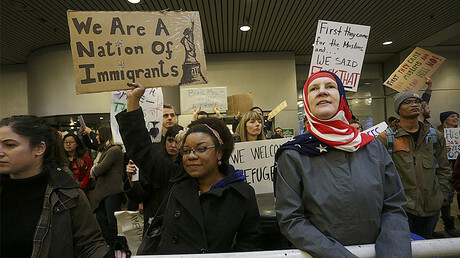 In their complaint, the states argued that the executive order “was motivated by animus and a desire to harm a particular group,” and that “the discriminatory terms and application of the Executive Order are arbitrary and cannot be justified by federal interests.” As such, the order is unconstitutional and violated the visa-holders’ rights, they said. Robart’s restraining order covers the whole country for at least two weeks until the preliminary injunction hearing, The Stranger reported. It also stops the government from enforcing the part of the ban that grants exemptions to non-Muslim refugees on the basis of their religion. Earlier on Friday, US District Court Judge Leonie M. Brinkema expanded and extended her order staying the enforcement of the travel restrictions in Virginia. She also allowed the commonwealth to join the lawsuit by Tareq and Ammar Aqel Mohammed Aziz, Yemeni brothers who are permanent legal residents and who were turned back at Dulles International Airport on Saturday. The two men said they were "forced to sign" forms giving up their status as lawful permanent residents "against their will and without their knowledge or consent," according to court documents. Brinkema noted that, although the president has “almost unfettered” power when it comes to securing US borders, “this is not 'no limit. '” Sha also had harsh words for the executive order, which she said was was poorly planned and rolled out. “It’s quite clear that not all the thought went into it that should have gone into it,” she said. “There has been chaos… without any kind of actual hard evidence that there is a need” to revoke visas that had already been granted. Brinkema did not hold government officials in contempt for reportedly preventing immigrants access to lawyers, a violation of her previous order. She told the court that she didn’t have enough information to make the contempt determination, even though Virginia had cited news reports and affidavits from lawmakers that US Customs and Border Patrol agents had not allowed attorneys access to the visa holders. “There were so many lawyers there willing to help, and not a single one got access,” Virginia Solicitor General Stuart Raphael said during the hearing. Brinkema also required that, by Thursday, the federal government provide Virginia with a list of all people with valid visas who were denied entry or removed from the US who had Virginia ties since the order was signed. At least 350 students at state universities, as well as professors and other employees, were affected by the executive order, Virginia officials said. On Thursday, the ACLU filed a lawsuit in a California federal district court, accusing the Trump administration of violating the religious freedom of those visa holders who were barred from entering the country. It proposes class-action status on behalf of nationals who are living or have lived in the United States and are from the seven countries listed in the executive order. "Senior advisers to defendant Trump have engaged in anti-Muslim rhetoric that provides additional support for the notion that the executive order was prompted by animus toward Islam and Muslims," the suit said. 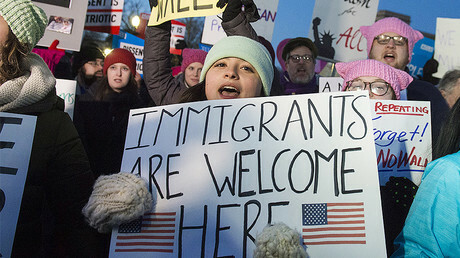 New York Attorney General Eric Schneiderman and Massachusetts Attorney General Maura Healey announced Tuesday that they would join lawsuits filed by the ACLU chapters in their respective states. Although the Bay State has joined in the ACLU’s lawsuit, Massachusetts state attorneys were in court seeking an extension to the seven-day restraining order against Trump’s travel ban that was originally granted there on Sunday. US District Judge Nathaniel Gorton did not issue an extension, but is reviewing arguments and will rule by Sunday. However, Robart’s nationwide restraining order provides coverage in case Gorton’s ruling does not extend the local stay. “If an Executive Order looks like a Muslim ban, acts like a Muslim ban, and has been talked about as a Muslim ban, then it’s probably a Muslim ban," Friday’s complaint read. The initial lawsuit in the commonwealth was filed Sunday on behalf of two state university professors from Iran with green cards who were detained at Boston's Logan Airport on their way back from an academic conference. An amended complaint added six new plaintiffs, including several non-citizens legally in the US who are afraid they will be unable to return if they leave the country, WHDH reported. Indeed, visas for two of the plaintiffs ‒ a doctoral student at the University of Massachusetts with family in Iran and a businesswoman who often travels to the US ‒ have already been revoked, meaning they will not be allowed to return to the country if they leave, said Joshua Press, an attorney with the Department of Justice, according to the Boston Herald. In Virginia on Friday, Reuveni said in court that 100,000 visas had been revoked as a result of the executive order. “The number 100,000 sucked the air out of my lungs,” Simon Sandoval-Moshenberg of the Legal Aid Justice Center, who represents the Aziz brothers, told the Washington Post. However, the State Department later said the number was actually less than 60,000. The US government issues about 90,000 visas a year to people from the seven restricted countries. Some of those visas last longer than one year, so the overall number of people from the seven countries in the US is much higher. Reuveni also argued that, since Sunday, green-card holders no longer face any enhanced scrutiny when entering the country. However, other legal visa holders already in the US have had their visas revoked, and so will not be able to return if they leave, Virginia Elliott, a spokeswoman for the Bureau of Consular Affairs at the State Department, told the Washington Post. On Sunday, DHS issued a blanket waiver for “lawful permanent residents,” ditching the case-by-case waivers that had been in operation prior. On Thursday, White House Counsel Don McGahn issued what he called "authoritative guidance" that green-card holders were not covered under Trump’s executive order. What the government says is happening and what volunteers at airports are experiencing are not the same thing, however. Although immigration attorneys are legally allowed to give face-to-face legal counsel to permanent residents still in the secured area of airports, that’s not what’s happening in practice. Despite Brinkema’s previous ruling, immigration attorneys at Dulles International Airport in Virginia aren’t allowed into the secure area to talk to visa holders. Instead, they wait until people exit into the main part of the airport. 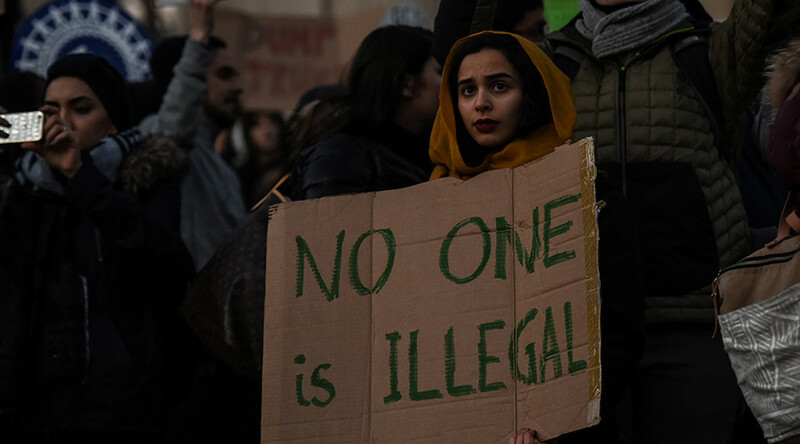 Even on Tuesday, after the ruling, lawyers were still only gaining information from arriving passengers who were allowed to enter the US, Sirine Shebaya, a volunteer lawyer, told Vox. Although returning green-card holders were being allowed in the country after extensive screening, first-time lawful permanent residents were still being turned away. Customs and Border Patrol agents refused to talk to Shebaya or Azadeh Erfani, who works with the Capital Area Immigrants’ Rights Coalition, according to Vox. That doesn’t mean that the CBP employees agree with the executive order, however. Regardless, having a sea of volunteer attorneys and translators, along with supporters, welcoming people into the country is a huge help, if even only to lift people’s spirits. “People are confused when they see a wall of people saying, ‘Welcome to America,’ but no one is angry that we’re here,” she added.